The University Toy Drive first began in 1996. To date, more more than 50,000 toys have been donated to children in North and West Philadelphia. More than 60 community groups will receive donations. On December 18, hundreds will gather in Drexel’s Grand Court as Santa and his elves will deliver 5,000 wrapped gifts to representatives of 60 community groups in the region serving North and West Philadelphia children. President John Fry will offer season’s greeting to community representatives. Throughout the winter, toys were collected for children in various boxes found around campus. 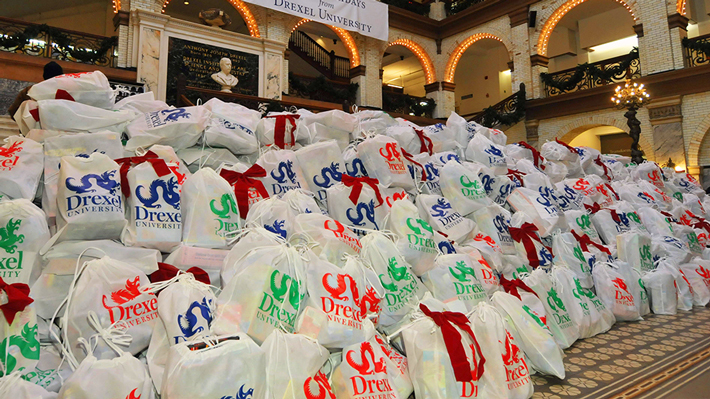 Last week, students, faculty and staff gathered in the holiday spirit to wrap the gifts and place them in red and white Drexel bags. The gift drive has been conducted annually since 1996 with more than 50,000 toys having been distributed to children in the region. The event will be held from 11:45 a.m. to 12:15 p.m.
Drexel LeBow staffers volunteer to adopt four families for the Holidays through a local non-profit. In an effort to brighten the holidays for area boys and girls, volunteers from Drexel LeBow helped sort and assemble toys donated to the Support Center for Child Advocates.